Every Tuesday and Wednesday during the month of May, we’ll be hosting a gluten-free guest blogger from around the web in honor of Celiac Awareness Month. Today we’re pleased to introduce Johnna Perry from InJohnnasKitchen.com, who shares her own gluten-free journey and cautions against the dangers of labeling others based on diagnoses. My journey as a food writer began six years ago with a blog dedicated to donuts, the kind filled with gluten. In fact, at the time, I didn’t even really know what gluten was. My plan was to visit 52 donut shops in a year, indulging in one donut each week. I chose to write about the donut shops on a blog to help me keep track, never imagining anyone would read it. Why donuts? Because they were the one sweet I couldn’t imagine living without. After a triple-digit weight loss, I discovered allowing myself one sweet indulgence each week kept me on track. I didn’t put much thought into what was in the donuts. Truth be told, I was more focused on calories than content. I truly should have been more focused on content, because no matter how much weight I lost, I didn’t feel optimal. I was anemic, my hair was falling out, I had less energy than before losing weight. I visited doctor after doctor trying to figure out why I wasn’t the picture of health, why I didn’t feel as good as I did at over 300 pounds. Midway through the 52 Donuts year, the latest in a string of doctors advised me to eliminate gluten. What the heck is gluten? I was handed a one-page list of foods: a long list on the left side of the page with foods that probably contain gluten, a short list on the right with foods that are gluten free. It was overwhelming. I had a meltdown in the doctor’s office parking lot when I realized donuts would not be permissible with this new dietary recommendation. The next stop was the bookstore. They had exactly two books on eating gluten-free: a sweets cookbook and a cookbook full of complicated recipes that took hours to make. Then it was on to the grocery store. I read labels on everything that usually landed in the shopping cart. That’s when I discovered nearly all of the food I was eating contained gluten. Veggie burgers, bread, salad dressings, frozen meals, energy bars…Gluten was EVERYWHERE! What would I eat? Well, thank goodness for Google and a neighbor with this disease I had heard vague mention of, Celiac. This journey hasn’t been all rainbows and unicorns. Even after finding all of that great information and support, I questioned if gluten was really the problem. I tried to eat gluten again. That means I went to my favorite donut shop. I got sick before I made it home from that indulgence. Gluten was apparently not going to be my friend. I felt I needed to seek out additional information from a doctor to help me understand what was going on, what was wrong with me. I found an integrative medicine M.D. with more knowledge of gluten-related illnesses than any of the previous doctors. I learned my testing options were a bit limited. On the advice of a previous doctor, I stopped eating gluten without a blood test. (Don’t do this!) Without a positive blood antibody test, my insurance company wouldn’t approve a biopsy. Yet eating gluten even once makes me sick for days. Doing a 21-day or longer gluten challenge, eating gluten every day to have a blood test, was out of the question. I chose to pay out of pocket for genetic testing, which came back conclusive that I have one of the Celiac genes and an allelic variant. I learned from the test results I have an HLA-DQ variant that binds gluten peptide fragments more strongly, triggering an autoimmune response more easily. While not a conclusive diagnosis of Celiac disease, it was enough to put me in contact with a gastroenterologist who reviewed my family history, including my father’s death from a digestive cancer as well as my personal medical history that began with childhood failure to thrive and progressed through many Celiac symptoms including dental enamel issues, canker sores, skin rashes, abdominal pain, constipation alternating with diarrhea, joint pain labeled as “growing pains” when I wasn’t growing. How had so many doctors missed this? I wish I were unique in this, but I hear similar diagnosis stories from many. While I don’t have the gold standard test results of a biopsy, the gastroenterologist felt certain I had Celiac disease without the benefit of a biopsy. Regardless of what I call it, Celiac disease or Non-Celiac Gluten Sensitivity, the fact is that I cannot eat gluten. I share this because I think it is important in our community of gluten-free eaters that we not be overly concerned with labeling each other based on what diagnosis box we fit into. Instead we should be more concerned with how we get healthy, how we stay healthy, how we support each other. Speaking of getting healthy, after all of this medical conversation, after all of the learning how to eat again, I started experimenting in the kitchen. I found great joy in creating my own gluten-free sweet treats for that once a week indulgence. Turns out I could keep writing about food, just with a different focus. And you know what else? There are still donuts, lots and lots of gluten-free donuts. What started out feeling like a huge loss in my life actually brought me back to health AND showed me that donuts exist for many people, many different ways of eating. I’m still going to have a donut and you can, too. Thanks for reading my story on becoming gluten-free. 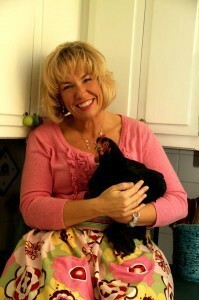 If you’d like to know more about my adventures in gluten-free cooking and travel, visit me at www.InJohnnasKitchen.com.